Here’s a photo of two locals and traveler about to enjoy a nice lunch Bora Bora style. With table and chairs in the beautiful blue lagoon. With some champagne on the table they look to be celebrating something special or simply just enjoying paradise in French Polynesia. What do you think they are celebrating? Leave a comment at the bottom of the page. In most places of the island, the lagoon water is not too deep, you can tell by the different shades of blue, the lighter the color the more shallow it is and vice versa, the darker the deeper the water. 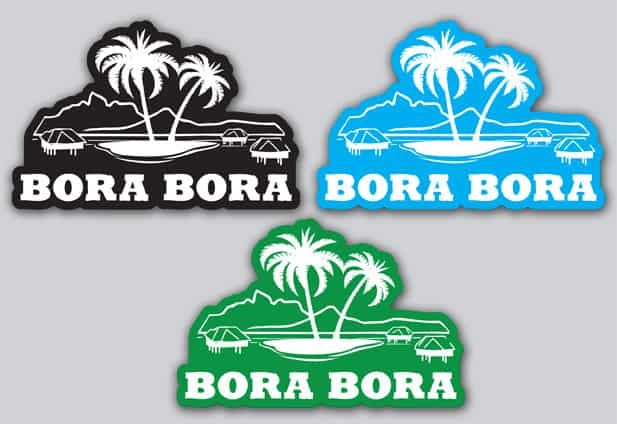 With such a beautiful location, just being in Bora Bora is cause for a celebration. The location of the photo could perhaps be on a private motu taken not too far from the St. Regis Resort by the look of Mount Otemanu. With the clouds covering part of the mountain peak you can still tell the angle of the highest rock. The overwater bungalows in the distance look to be the Le Meridien Bora Bora resort. The Le Meridien resort is home to the Bora Bora Lagoonarium which is a place to swim with sea turtles and other marine life.